The TEC 2015 Human Capital Management (HCM) Software Buyer’s Guide for Midsize Enterprises explores best practices and core HR processes for a winning HCM strategy, and the leading software solutions that can help support them. Midsize companies often strive to be as agile as smaller businesses but compete for talent as zealously as larger ones. The TEC 2015 HCM Software Buyer’s Guide explains that the key to staying competitive is adopting practices from both their smaller and larger counterparts as well as seeking out the latest innovative technologies to support their HCM strategy. 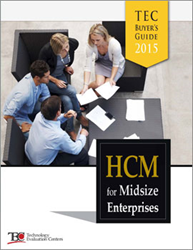 This buyer’s guide examines the high-level features offered by HCM software providers targeting midsize organizations, and discusses how midsize companies’ HCM technology needs more or less correlate with their company size or, more specifically, the number of people they employ. The guide also looks at the importance of core HR functionality and practices to further grow other HCM areas within the company, such as talent management, learning management, and workforce management. TEC’s HCM Software Buyer’s Guide provides midsize organizations tips on how to be agile like their smaller counterparts as well as how to compete for highly-skilled talent like their larger counterparts. These companies will also benefit from real-life customer success stories, presented in the guide, which highlight how HCM software has helped address common business challenges. Featured HCM software providers include BambooHR, Cornerstone OnDemand, FinancialForce.com, HRIZONS, IBM/Kenexa, Infinisource, Infor, and Zenefits. The TEC 2015 HCM Software Buyer’s Guide includes key takeaways of and lessons learned by top-performing midsize organizations in competing for talent and selecting appropriate HCM technologies; product comparison charts depicting core functionality of industry-leading HCM solutions; and a comprehensive directory of HCM software providers on the market. To download your free copy of the buyer’s guide, visit http://www.technologyevaluation.com/research/TEC-buyers-guide/TEC-2015-HCM-for-Midsize-Enterprises-Buyers-Guide.html. For information on TEC’s software advisory and selection services, contact +1 514-954-3665, extension 404, or e-mail selectionservices(at)technologyevaluation(dot)com.